Above is a screenshot of my bike miles spreadsheet. I enter the current odometer reading, and the spreadsheet kicks out all those numbers. 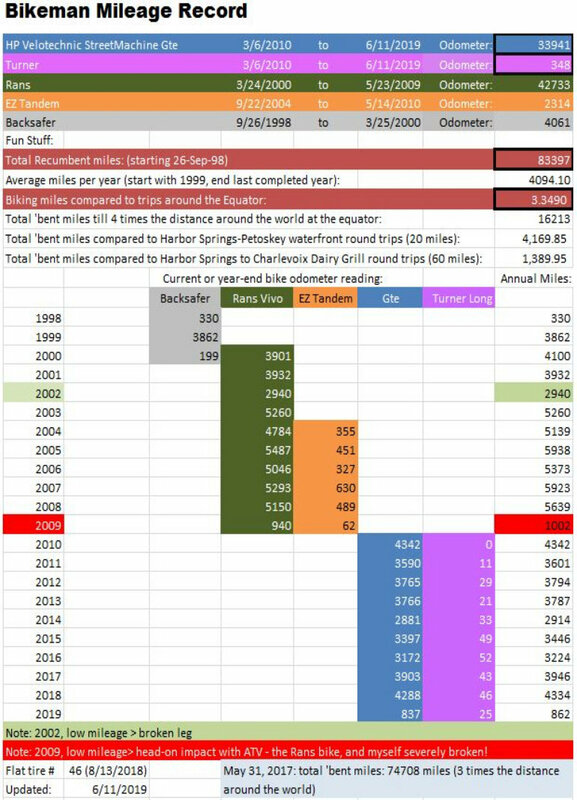 I only had enough time before the snow hit to ride the Backsafer (my first recumbent bike) for 330 miles in 1998, so to figure the annual averages, I start with the 1999 year's mileage. The Rans Vivo, arrived March 24, 2000. and on the last ride, it had 42,733 miles on the odometer. Sad to say, it is now gone. It will be sorely missed... On May 23, 2009, it was destroyed by a head-on crash with an All Terrain Vehicle that was being ridden on a NON-MOTORIZED bike trail. May 1, 2010 was a fun day for me. My wife and I rode to Charlevoix and back home for a round trip of 63 miles. That was the first time I have done my favorite day ride since the 2008 riding season. I was only able to ride 1002 miles during 2009 because of all the injuries from the crash (see the "Bike Crash" page). Also on the same ride, I passed the double Equator (49,804.8) overall mileage, and my wife saw her odometer hit 10,000 miles! It was fun seeing the odometers counting up all those miles. June 18, 2018, my Streetmachine odometer hit 30,000 miles, and just two days later, Donna's Burley Django's odometer hit 30,000 miles. I think we bought her Burley late summer of 2002. I feel like it's quite a personal accomplishment, since until probably late in July of 2009, no one knew if I would even walk again, much less be able to work or ride a bike again. Since that crash, I've ridden my current bike 33,209 miles. I am so thankful that the Lord God I beleive in has healed me so well that I can go out and really ride again. I missed it like crazy during the summer of 2009, (the time spent with the wheelchair, walker, and cane was not fun). But as of 2010... Bikeman is back!